Ready to learn how to make a DIY Watercolor Painting? I'm all about making my own art and this was a quick and easy project. 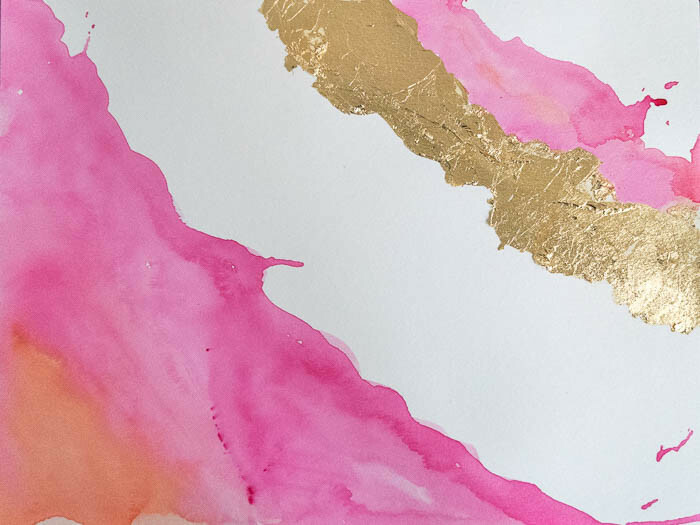 We’ll see how to watercolor paint, how to paint DIY abstract art, how to apply gold leaf to paper and at the end of the day, you’ll have your very own DIY abstract painting….but first, the back story. I'm still doing some decorating in Kate's room…but it's been on a rather sporadic basis. I've been trying to squeeze it in between my knitting projects and my uncluttering projects. The truth is, I rarely start and finish a project without several detours along the way…can you relate? Still on my ‘Kate's Room To Do' list was to gather some art for the ubiquitous gallery wall that she requested. We re-purposed many pictures and frames that we already had, but we needed some pops of pink and, as is my wont, I opted to try and make some nice piece of DIY abstract art instead of buy it. This was a nice, quick project and a needed respite from the paper mache trophy ram's head that I've been working on. Talk about a messy project! With any luck, I'll be finishing that bad boy up this weekend. The ram's head SHOULD be the final element for a Bang Up gallery wall. Fingers crossed. Once that's done, I'll be back to give you a total roundup of what we did and how we did it. If you're at all like me, you may have most of these items already on hand. 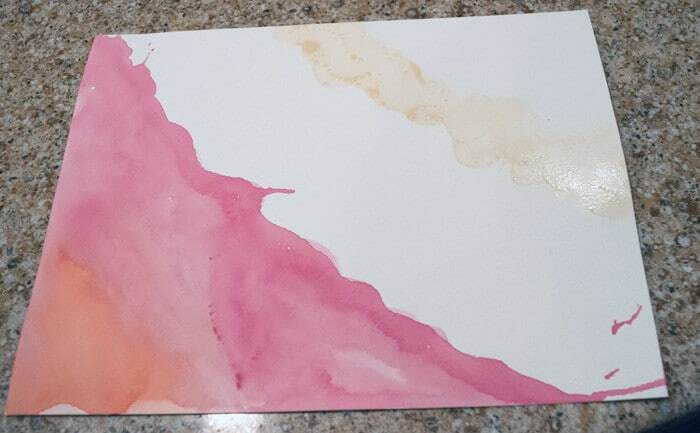 The only thing I needed to purchase for this project was the tube of pink watercolor. If you can't find what you need, Michaels will have supplies for most every crafting need under the sun. You can order online here and have it shipped or you can pick it up at your convenience. When I think about how to watercolor paint, I like to lay on the colors that you want in the watercolor painting. By using your brush to ‘draw' a line in the paint, you create a barrier that the paint really doesn't want to cross, but will if really forced to. Since we're talking about an abstract painting, I made my line a little wonky, as opposed to a straight line. 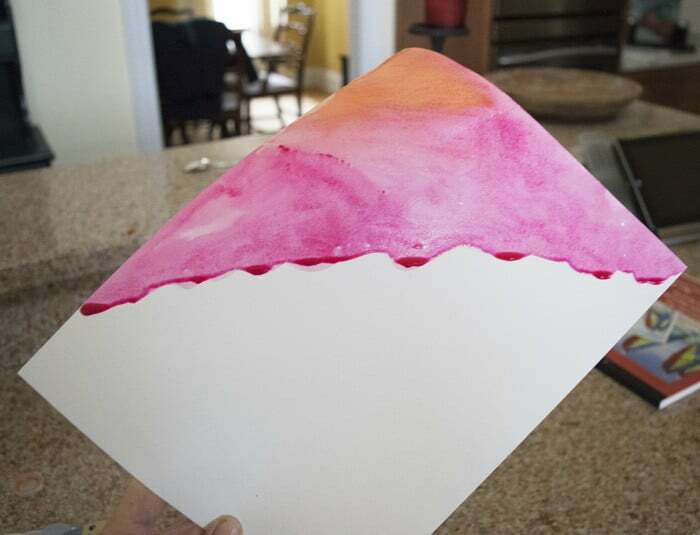 You can force the paint to ‘cross the barrier' by holding the paper up and lightly tapping it on the counter. I like the way this made a few streaks of color to go out on their own. Once that is dry, lay down the gold leaf adhesive where you want the gold leaf to be. You don't need much of the adhesive, a thin coat will do. I am always looking for ways to use gold leaf in paintings…this was a no brainer! Wait about 45 minutes before you lay your gold leaf in pieces over your adhesive. Take a sheet of gold leaf. If you haven't worked with gold leaf before, it is some fragile stuff. Don't panic if it tears, wrinkles or folds. That's part of the characteristic of it. You'll notice it really wants to cling right to the adhesive. 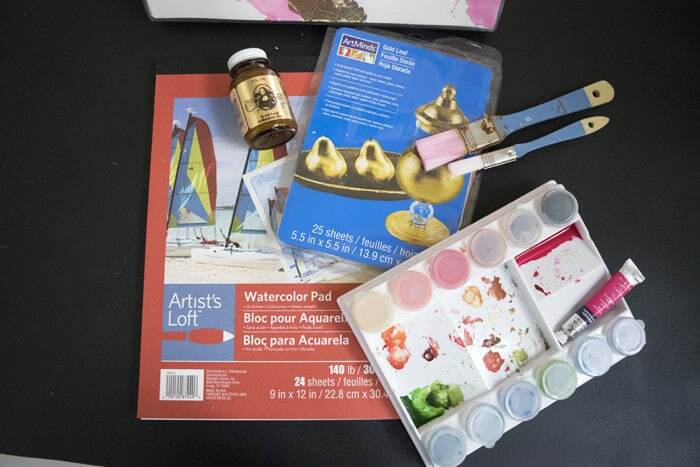 Use a soft brush to gently brush the gold leaf away from the areas with adhesive. I went back and added a bit of pink with a wee bit of orange on one side of the gold. I did the same procedure where I held it up and shook it to get some of the paint to move. This DIY watercolor painting was such a quick and fun little project to add some abstract art and needed color to a gallery wall. If you are interested in making your own DIY Watercolor Painting or want to see how to paint abstract art, then bookmark this page or pin the following image for your future reference. This abstract design is available as a phone case, a framed print or canvas or as gift cards at our Society 6 shop – please stop by and see our work – click here to visit! Will your talents never end? Did I not call you the renaissance woman? This is gorgeous! Just the right amount of gold to make it look gorgeous! Hi Mary, You are so sweet. I can always count on kind words from you, you always lift me up. Thanks so much for stopping by! Hi Katrin, with your mad skills, you could knock this out in no time. Get some gold leaf and adhesive and have at it It’s a fun and quick project. Kate saw the post and she does love it…thankfully! thanks Jenna! It was a fun and quick project, which is just what I need from time to time. love this! So beautiful. Pinning to give a try. And, I can fully relate to the sidetracked projects. Story of my life. Especially decorating our home because it seems I never have the budget or time …. or I change my mind! The rooms slowly get pieced together and that is just fine. In the end, the results are worth it. Hi Sarah, I’ve got to believe that we are not in the minority on the sidetracked project challenge. At any one time I’ll have 4-5 projects in the queue. My problem is that I come up with projects faster than Terry has the energy to do them. Oh well…guess I wouldn’t know what to do if my list got too small. Hi Mila, I am all about making my own art. I’m not blessed with patience, so instead of waiting until I can find or afford what I want, I end up making it…mostly so I don’t have to wait! Not sure that’s a good thing, but it’s made me resourceful! Thanks so much for stopping by and so happy I was able to give you a wee bit of an idea. Resourceful is always good ! Hi Cassie, thanks for stopping by and I’d love to come back next week! I’m planning on it. I completely agree with you…this was such a simple project, but the gold leaf gives it a bit of ‘je ne sais quoi’ (high school French still there…yay me!). This is my kind of project too…think of something and then within an hour I have a finished project. I’m all about (well, mostly all about) immediate gratification. Hi Mandi, thanks so much for your sweet words. I love seeing your photography, you have such a great eye, so your compliments on my art creations are so appreciated. So glad you popped in for a visit today. Lynn, this is GORGEOUS! Seriously gorgeous, And you made me feel like I could conquer this, too. Thank you for this! Thanks so much sweet Allison! Honestly, so very easy and I know you could make it. I’d love for you to try it…and the supply list is very short. I love making art like this, especially when it turns out like I imagine it. So appreciate you stopping by today. This is so pretty! Now I want to bust out the water colors and make some art. Good Morning Yami…get those watercolors out of their drawer, get your brushes out of their jar, grab a piece of paper…or two…and have some new art by this afternoon! So glad you stopped by. Nice painting Lynn, I like the use of golden colour. Thanks Sadhna, the gold is one of my favorite elements of it as well. Good Morning Michelle, I do agree with you. If I haven’t created the art on our walls, its art that we have some connection to…a friend painted it or it’s a place we love or an image that means something to us. I think she’ll really love it. She’s still away, but of course I sent photos of the layout before I put nails in the wall… she is a young lady with very strong preferences! Lynn, this is awesome! I might try doing something similar for our bedroom or bathroom. I love the gold leaf you added for that bit of bling! You come up with some really great ideas and I look forward to seeing what the next one will always be. Hi Carol.. thanks for your very kind words. Coming from you…you of the DIY heart map brilliance…I am truly honored. I really hesitate to call it a ‘painting’ since it took me all of 2 minutes to roll some paint over some paper…I feel like it’s cheating a wee bit, but oh well. I do love it, no matte what it’s called. If you do make one for your bathroom, I’d love to see it! Can you come decorate my girls’ room? They would love everything that you’ve shared with us from your daughter’s room make-over. This is so beautiful, but then you are a talented creator. You make it look easy. This is so beautiful! I never do painting because I’m worried that I don’t have enough skill. But, this looks so great! I love your tutorial and think that I might be able to do it. I particularly think that the colors you chose look fantastic! The pinks with the goldleaf are phenomenal! I love making my own artwork and this tutorial is awesome! Thank you so much for the inspiration. I LOVE THIS! Yours turned out beautifully and you made it look easy enough for me to try! ha Thanks for sharing at Your Inspired Design. Hi Holly, it was so easy…really. There’s no right or wrong way…my kind of project. I encourage you to give it a whirl and I think you’ll be pleased with your end result. oh man, this looks gorgeous. whenever i try to create anything like this or any art for my walls, i feel like it looks like i created it! ugh. this is gorgeous. So sorry I’m so late in responding, for some reason this got sent to spam and I just found it. But I do so appreciate your kind comments and would love to encourage you to try again. My guess is that you are judging yourself too harshly. Hmmm…I hadn’t heard that and I have several paintings I did with gold leaf that I have never sealed and years later they are find. But, I’m guessing you could use any non-yellowing acrylic spray paint…lightly over the entire painting. You are so welcome. I’d love to know what you end up making. Wooow, this looks amazing and simple enough for me to try. Glad I came across thisand thanks for the share. Good Morning Alisha and thanks so much for stopping by and leaving your kind comment. That painting was so easy and fun to do and I’m so glad it might have inspired you even a wee bit. How did you go about mounting the paper for the gallery wall? I used a ‘frameless’ frame like this https://amzn.to/2HVwrhN (affiliate). At the same time, you could use a traditional frame…think that would be lovely too. Thanks so much for stopping by and hope this answers your question. If not, do pop back by.